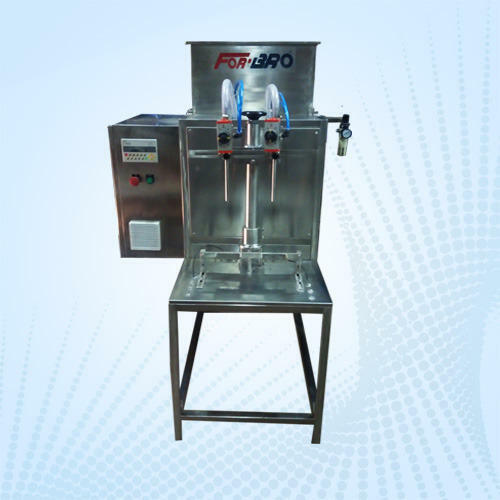 For-Bro Engineers, brings a Semi-Automatic Servo Pump based universal liquid filling Machine for filling liquid and viscous material such as Oil, Pesticide, fertilizers, chemicals, Sanitizer , liquid Soap, Honey, paint etc. As the industries are moving towards the customized packaging to suite the wide range of client base where wholesale clients prefers to have higher pack-sizes whereas Retail Users demands smaller pack sizes. In a conventional piston /syringe based liquid filling machines it is a must to have a syringes for various sizes to suite this requirements. Two head servo pump based liquid filling machines are the solutions to meet these requirements. Pack-size can be easily changed from PLC HMI unit from the front panel without needing to change any components or parts thus reducing lot of manual effort. Setup parameters helps to control the coarse and fine filling of liquid thus providing higher accuracy. Multi-level password protection, Data logging and reporting and Pre-set Recipe for one touch operations can be provided as per client’s requirements. Machine can also be provided with 4/6/8 head for high speed high volume filling. We are leading Designer, Manufacturer and Exporters of one of the finest range of Packaging machines and Equipment for industries such as Pharmaceuticals, Chemical, Pesticides, Fertilizers, Food, Agriculture, Dairy and Health. Three decades of Experience, Innovative use of cutting edge technology, Modular construction, Adaptable design and High quality manufacturing process helps us to deliver some of the finest packaging machines and equipment such as Auger Fillers, Volumetric Cup Fillers, Form Fill and Seal Machines, Band Sealers, Single and Multi Head integrated packaging with capping and labeling machines for Powders, Granule, Liquid and Paste. We also manufacture high performing processing equipment’s such as Blenders, Sifters, Conveyor belts, Colloid mill and Multi-mill. These machines are available is wide range and capacity to suit product and production requirements. Large number of packaging machines and equipment’s are successfully running all over India, South Asia, Africa, Middle East, Indonesia, United Kingdom and New Zealand.